Quarters. Photo by Michael Horne. Since 1986, this tavern at the northeast corner of N. Bremen and E. Center streets has had a single owner/operator. That’s considerable longevity for any saloon, even in Milwaukee, especially considering that Quarters, as a self-proclaimed “Rock and Roll Palace,” has by its very nature a younger audience that is going to turn over rather rapidly. By the time you’re in your thirties, headbanging in a club until closing time tends to wear thin. At the time Daniel R. Fischer opened this place, 31 years ago, E. Center St. was still a no-man’s land. With the exception of the prominent Uptowner, located on the busy corner at N. Humboldt Blvd., two blocks east of here, the commercial street was better known for its empty storefronts than its mercantile vibrancy, and a place like this came cheap. Fuel Cafe, 818 E. Center St., now regarded as the pioneer in the revitalization of the retail strip, was not to open until 1993. Since then a number of establishments have opened or ramped up their game, including Company Brewing and Cafe Centro, both of which have nudged the old district straight in the direction of classy. Quarters has not taken that direction, instead occupying its 1,375 square feet of space just as it always has: as a place for bands to play, for folks to hang and bang while bands are playing, and for beers to be sold cheap. 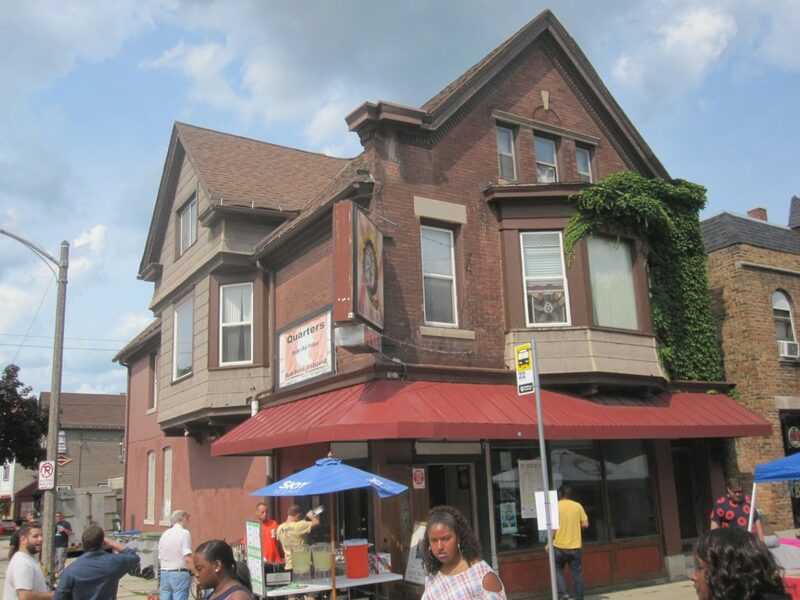 If you look at the handsome building that houses Quarters, you will note it fits the description of many Milwaukee structures built as taverns, what with a corner entrance and a flat above. But it has not always been a bar, and was instead built at what was then 28-Center St. in 1904 for $3,500 by architect S. F. Kadow as a grocery store for Albert Bruski, who occupied the apartment above with his family. We have seen this set-up before in buildings that were one day to become taverns. (Bosco’s was originally a grocery store, as was the former Hybrid.) It wasn’t until this building was 30 years old that it became a saloon, which it has been ever since. By the time this place became a tavern, it had already undergone a number of changes. Owner John Jankowski paid $500 to alter the storefront in 1925, most likely creating the entrance configuration we see today. The door probably originally opened right onto the street, perhaps obstructing the right of way. This was a common fix of the era. On June 7th, 1929, just in time for the Great Depression, Charles Jakubowski built a concrete block garage 18 feet by 20 feet at the north end of his lot, abutting the alleyway that separates this place from the Foundation bar. A couple of weeks later, he spent $100 to build a curious little structure, also of block, attached to the south end of the garage. This tiny space became a “Filling Station Ordinary,” according to city records. (“Ordinary,” in this case, refers to its solid masonry construction. 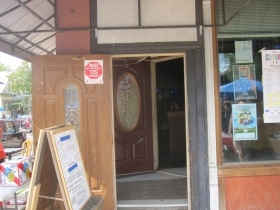 The bar itself is a wooden building with brick veneer.) We have also found that Bosco’s had a filling station in its back yard, run by Bob Uecker‘s dad. 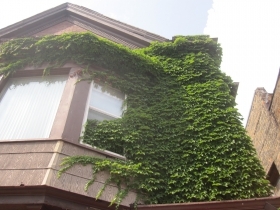 In 1930 Jakubowski spent $25 to add a rear porch to the second floor of the main building, probably as a place for his wife to hang laundry to dry. It remains, overlooking the two curious concrete block structures in the back yard. Perhaps flush with cash from his petroleum operations, Charles (or Casimir) Jakubowski gave up the grocery store and had Anthony Jakubowski run it as a tavern. “No Dance Floor,” the city warned on its license dated August 3rd, 1934, noting the property’s former use as “Grocery Store.” By 1936 August Woloschak operated the tavern, which he rented from Jakubowski. The place plodded along for a decade or more, with John Nentz taking out a permit to sell Christmas trees from the back yard in December, 1952. By March, 1953, the building was sold to Joseph Zywinski, who paid $23,500 for the place, which was only assessed at $9,700 at the time. The price presumably included the business and fixtures. Roman Zywicki called the place “Whitey’s Tap,” and in September 1960 he hung a Blatz sign on the corner of the building. The bar then went through a quarter century of turbulence, as far as management was concerned.In June, 1967, William McCarthy opened a tavern here. 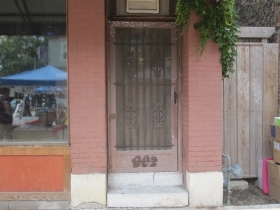 In July, the city warned him to “Procure occupancy permit within 5 days.” The next year, Zywicki leased the tavern to Ronald Du De Voire, but he didn’t last long, being followed in 1969 by Fred A. Dix, who ran the place as Fritz and Duffy’s Tavern, a good Riverwest bar name. In 1971, Gene Hooser ran it. In 1973 Rhynell Person took out an application to run the bar there, but it was cancelled. Floyd Hambel got the license in 1973, and ran it as Floyd’s Place, another good Riverwest name, and hung a Special Export sign in 1978. You could pretty much copy-and-paste that building description today. By 1982 the building was owned by Arnold and Janet Danielson, and in 1983 they leased it to Steve Charusch, who ran it as “Hey Frederick’s” for a brief time. In 1985 Robert J. Heinz was listed as the last operator until the Danielsons leased this space to the current operator, who purchased the building from his landlords in 1991 for $45,000. A Few Changes Made. Snipers at Large! 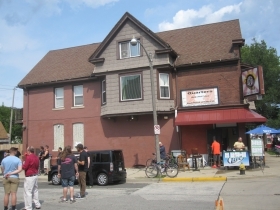 At the time Dan Fischer bought the place, Quarters had a capacity of 25. Today it is 80. In April, 1988 Fischer took out a permit to “remove portion of wall on 1st level to increase floor area of game room. Residing front entry outerwall over existing platform. Ald Hoeh has no objection,” according to city records. It shall be unlawfil to place, erect, tack or otherwise fasten, use or maintain any snipe advertiising or deface any exterior wall or surface of any building, board, barrel, box, case, railing, pole, post , tree, barricade, material, dock, pile or structure of any kind with advertising or notice of any kind. Enforcement of the snipe law was a common recourse to a problem faced by residents of the city who were offended by seeing band posters on the surface of every building, board, barrel, box, case, railing, pole, post, tree, barricade, etc. etc. etc., especially near entertainment districts like Center Street, North Avenue and Brady Street. It was easy to bust the tavern owners, since the snipe ads, by definition, included the name and address of their businesses, as well as the date of the bands’ scheduled performances. The tavern owners, for their part, had little control over where the snipes would appear, since it was the band members and their followers who were doing the sniping. The matter was never fully resolved until the internet era put band announcements on everybody’s phones. However, posters are still being produced by bands, and, with the advent of coffee shops and a new era of vigor on Center St., there are plenty of legal places to hang posters nowadays. As works of art, most surpass the quality of the music they promote. But, that’s Rock and Roll for you. Quarters has recovered from a rough patch in 2010 when its license was suspended after a homicide occurred outside the property. Its awning-covered front window opens on to Center St., although the windows to the west remain boarded up, reminiscent of the old days in Riverwest, which featured more plywood than glass in its fenestration. The building has good bones, as they say, and the curious garage and gas station to the rear are architectural novelties. Inside, the place shows the promise of what it will likely become as the gentrification of the area continues. But since you are looking at it in real time, it provides a glimpse of what can happen to an interior after more than a generation as a small Rock and Roll club. The stage is tucked off into a corner of the front room. A soiled blue curtain provides the backdrop and perhaps some acoustic buffering. A dusty fan hangs from the exposed brick chimney that provides a sort of proscenium for the stage. There is a string of lights above the stage, and the original wooden tongue and groove ceiling is painted black. 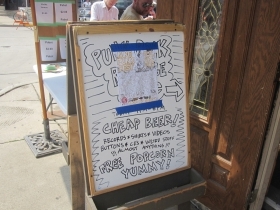 Popcorn and tortilla chips provide the food here, along with a selection of victuals available in a vending machine that also sells ear plugs for a buck a pair. The old game room, with its maple floor, looks lonely without a pool table. But an electronic dart board will serve for amusements. (Pool takes up too much space in a tiny bar, especially one that is used for live entertainment.) The walls are panelled in the diagonal pine wood that was popular back in the Floyd’s Place days. The men’s room urinal is wall-hung, and is the only one I have encountered that has band stickers pasted to the actual working surface, a testimony to the high quality adhesives we have on the market nowadays. The toilet paper dispenser is also liberally adorned. 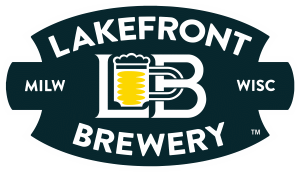 Thirty years ago you could get Andeker here on tap, but today the lines have been discontinued, and the beverage selection comes only out of the cooler. Description: Former grocery store has been a tavern since 1934, and a “Rock and Roll Palace” under current proprietor’s continuous ownership since 1986. Unlike most other similar establishments, it tends to not have an existence outside of its musical realm. Not exactly a place to drop in and hang out, whether or not there is music. Seems secure as long as the format holds out, but could readily be adapted to a corner bar. Estimated Annual Rent: 1,375 square foot tavern @ $8.82 per square foot = $12,128.00 per annum according to Assessor’s calculations. Legal Entity: Metro Enterprises, Inc., Daniel R[alph] Fischer, [DOB 07/11/1952], Agent, 100% Owner. County Supervisor District: 13th, Willie Johnson, Jr.
Bike Racks: Two right in front of the building. So many facts I didn’t know about Quarters! Thank you, Michael Horne!